City: 15 – Hwy: 25	Actual rating will vary with options, driving conditions, habits and vehicle condition. 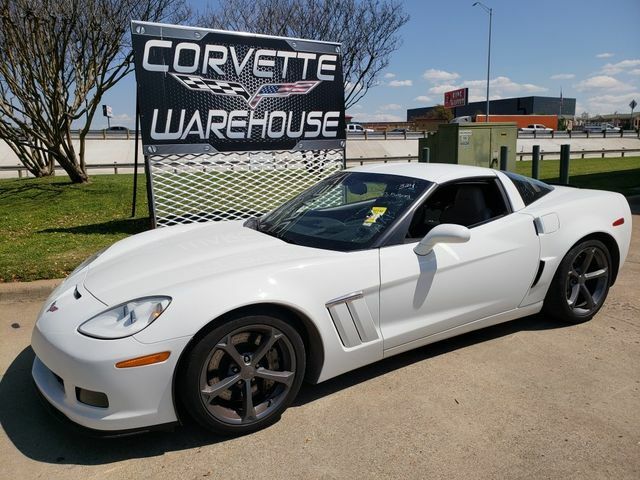 2012 White / Gray Two Toned Leather Z16 Grand Sport Coupe 2LT, 6-Speed Transmission, HUD, Navigation, Removable Top, NPP Dual Mode Exhaust, F55 Magnetic Ride Control, and the GM Competition Gray Wheels with only 55k Miles. This White C6 Grand Sport Coupe comes equipped with the 2LT Option Package, CD player, Bose radio system, HUD, power seat, power windows, power locks, power mirrors, dual electronic A/C, removable top, navigation system, NPP dual mode exhaust, F55 magnetic ride control, and the Competition Gray Wheels. It is in excellent showroom condition and has been highly maintained. Audio system with navigation, AM/FM stereo with CD player, MP3 playback and DVD-based touch-screen navigation USB port, auxiliary input jack, seek-and-scan, digital clock, auto-tone control, Radio Data System (RDS), automatic volume, TheftLock, 6.5″ LCD color display and voice recognition.